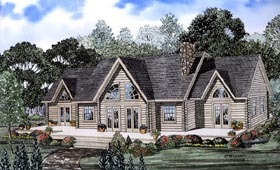 With its deck and several entryways to the home, makes this plan unique. The Great room has a see-thru fireplace, leading into a Den/Study area. The Dining room opens to the Kitchen. The Master suite is spacious with access to Deck and large walk-in closet. Enjoy the privacy of the Master Bath with a choice of corner shower or Whirlpool tub. Bedrooms two and three on the upper floor provide ample closet space and share a full bath.